This card can be used as a substitute for any 1 Fusion Material whose name is specifically listed on the Fusion Monster Card, but the other Fusion Material(s) must be correct. You can discard this card to the Graveyard; add 1 “Polymerization” from your Deck to your hand. King of the Swamp is a very old card, but one finding renewed use in Prank-Kids. Simple to use, and great if you can utilize it. Use it in conjunction with an Prank-Kids monsters to get to your Fusion Monsters and get the ball rolling, or use it to search out the Polymerization you need to Fusion Summon. Any deck can use this card if they need a Fusion substitute, but it works best if you work Poly into the mix. Not much else to say: an example of an old card returning to life. King of the Swamp is a very old card that can act as any specific fusion material monster. It can also be discarded from the hand to search an even older card, Polymerization. I like that there are no once per turn clauses here, but the stats are horrible. This Level 3 Water Aqua-type monster with 500 Atk and 1100 Def will probably never see the field barring some Soul Charge plays. Not much to say really. There are still decks that list specific material like Invoked and Dark Magician or even Blue-Eyes. But those Fusions have other ways besides Polymerization to fuse. Other decks might sneak this into the grave just thin the deck and go old school with Dragon’s Mirror or something. Anyway, the art doesn’t have fusion swirls, and I appreciate that. Throwback Thursday this week goes to a card that helps search a very popular Fusion Spell as well as act as a substitute for a specific Fusion Material for a Fusion Monster, almost like Prank-Kids has a Fusion with specific summoning requirements. The card we look at today is King of the Swamp. King of the Swamp is a Level 3 WATER Aqua with 500 ATK and 1100 DEF. I can say whatever I want about how bad the stats are and how the type and attribute combination does work, but you’ll never really summon this to be honest. As I said, this card can be used as a substitute for any Fusion Summon of a Fusion Monster, just as long as said Fusion Monster lists a specific monster as material and this card is being treated as said specific monster. Nice to be able to have a substitute in case you are missing a specific monster, and there are still Fusions printed from time to time that ask for one or more specific monsters. If you don’t use this to substitute for a monster, you can also discard this to search for Polymerization to basically substitute this card for a Fusion Spell. Now note this card must search Polymerization, so no Super Poly search with this, but Fusion Substitute is always treated as Polymerization so this can search for that. King of the Swamp is a useful Fusion Support card for Fusion decks that still want to use Poly along with having Fusions with specific requirements. Worth running in several different Fusion decks, including Prank-Kids, though that YCS winning deck didn’t use this if I remember, but that doesn’t mean you can’t use it. Art: 3.5/5 I don’t even know how to explain what is going on with this art. This is an odd case, also, where I only reviewed 1 of these 3, (the first was before I was on the team in 2004) and I just missed the most recent one, (even the best of us are absent now and again). I like King of the Swamp, anyone who knew me as Dark Paladin before I became…well, me…should know that, and this is…was…a good Dark Paladin Deck card. It’s arguably the most versatile way to use Polymerization to fuse, if you need to do Fusion in that manner. 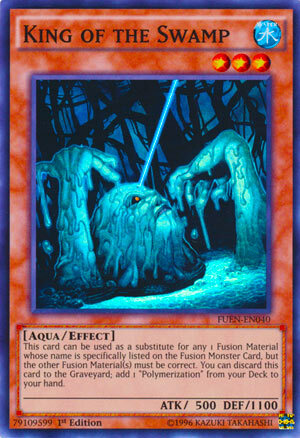 King of the Swamp is able to fetch you a copy of Polymerization or be used as a Fusion substitute for about anyone in about anything (notice about, but I assume even if you’ve never used this, you’re vaguely familiar with it). This is textbook old school, as far as Yugioh goes. I wouldn’t at all fault an expert or a newcomer to the game for using this if they needed normal Poly for a theme…like Prank-Kids.